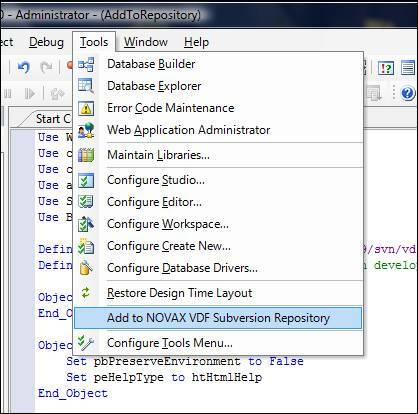 This Visual DataFlex Studio addon takes the current workspace and creates a new entry for you in a Subversion source code control repository. Most of this happens automatically and gives you a good base to put your Visual DataFlex project under source code control. The tool takes the workspace and creates a new entry on a specific repository by creating a new directory with the workspacename as the new directory name. The idea is that all workspaces in the same repository are each in their own subdirectory. In that way libraries can also be subversioned along with the workspace if they are added with relative paths in the workspace. However for now, Libraries have to be added to the repository as a workspace themselves. A subdirectory is created on the repository named "Main" for the main production line. After this it checks out the new directory on top of the workspace's home directory so that the workspace becomes a "working copy" from the repository. Next the tool runs though the workspace and adds the paths for AppSrcPath, BitmapPath, DataPath, DdSrcPath, HelpPath and AppHtmlPath. The IdeSrc path is added but no files from the directory. The same rules apply for the Programs path except that the workspace configuration file is added. Finally the whole thing gets committed to the repository. be changed in the beginning of the src file. installed. The code was created using Visual DataFlex 14. To set it up in the studio add the following line to the Tools Menu.